My only obstacle to calling Ireland is coordinating the time difference. From my iPhone, I reach out to family and friends from home, office, or while traveling. The device’s digital connection also allows me to text and Tweet, and read The Irish Times as easily as The Washington Post. Communications were not always so instant, as just remembered at the north Kerry seaside town of Ballybunion. There, on the eastern edge of the Atlantic, on March 19, 1919, an engineer working for Guglielmo Marconi transmitted the first spoken words across the ocean to Nova Scotia. 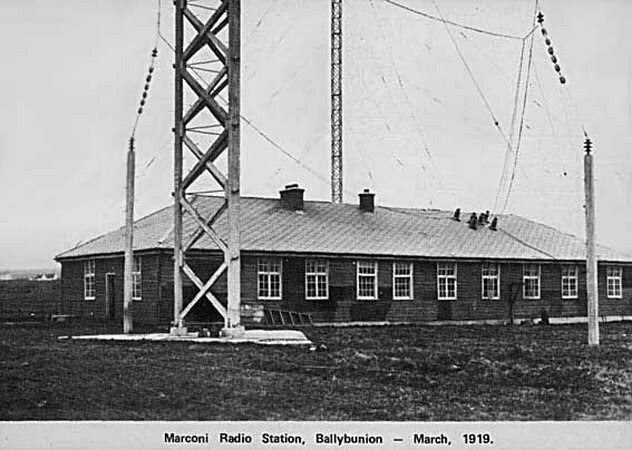 Sadly, the original wooden wireless station hasn’t been around since the Civil War era, but the Irish College made for a perfect replacement as all decamped there for the repeat broadcast. It was successfully picked up at a station close to the original receiver in Nova Scotia in a communication that gave many present a thrilling sense of the history – not least the numerous amateur and professional radio operators from across the county and region gathered. Three months after the original transmission from Ballybunion, British aviators John Alcock and Arthur Brown made the first nonstop transatlantic flight from St. John’s, Newfoundland, Canada, to Clifden in County Galway, about 100 miles north of Ballybunion. Their trip in an open cockpit took just under 16 hours. Today, I fly from Washington, D.C. to Dublin in less than seven hours. Even as airline seating has become more cramped, the safety and amenities of commercial aviation is taken for granted. A century ago, communications and travel each entered a new age. This entry was posted in Business & Environment, History and tagged Ballybunion, Clifden, County Galway, County Kerry on March 23, 2019 by admin. The “Wreck Viewer” digital mapping tool released by Ireland’s National Monument Service is generating media attention and interest among historians, divers and others. Nearly 4,000 wrecks are featured in the interactive map, from prehistoric log boats found in inland lakes and rivers; to the RMS Lusitania torpedoed in May 1915 by a German U-boat; up to a 62-foot fishing vessel that sank in January 2017. …the development of the Wreck Viewer is an ongoing project and the Viewer should not be relied upon as a definitive listing or display of all known wreck data. Records will be added to, refined, and updated on an ongoing basis and as new information becomes available. Shipwrecks with known locations shown on the map are only about 22 percent of the total number of records contained in the agency’s database. The locations of approximately 14,000 more wrecks remain to be confirmed, though some details about them are available in a downloadable database. The Sea Lark is a case in point. The 19 November 1846, wreck at Ballybunion, County Kerry is part of the Monument Service database, but it is not shown on the map. It is missing from the Irish Shipwrecks website, but found at IrishWrecksOnline.net, both independently produced listings. Bryan MacMahon details the Sea Lark‘s plunder in The Great Famine in Tralee and North Kerry, Mercier Press, 2017. Fin Dwyer wrote about the episode in Irish Central. The wreck is also referenced by Danny Houlihan in Ballybunion: An Illustrated History, The History Press Ireland, 2011. 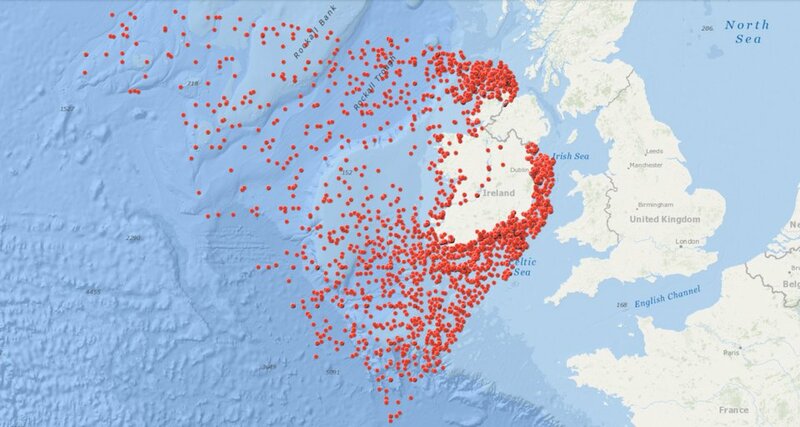 The Monument Service database contains some details of 73 wrecks in Irish waters during 1846, but only two unnamed vessels are shown on its map: a February loss 190 miles southwest of Baltimore, County Cork; and a September sinking more than 300 miles southwest of the same coast. The Irish Shipwrecks database lists three vessels lost in 1846; two off Down and one at Wexford. This entry was posted in Business & Environment, History and tagged Ballybunion, kerry, Sea Lark, shipwrecks on June 21, 2018 by admin. Two July 1917 events in the west of Ireland shaped the county’s struggle for independence from Britain. A century later, however, both seem to have be mostly forgotten, prompting criticism from at least one historian. The first and most significant event was the election of Sinn Féin candidate Éamon de Valera in County Clare. The by-election was called to fill the seat left vacant when Irish Parliamentary Party member Willie Redmond was killed in World War I. The IPP represented the late 19th century effort to secure limited domestic autonomy for Ireland, called home rule. de Valera, one of the rebels of the 1916 Easter Rising who was released from prison in June 1917, belonged to the new generation of Irish republicans seeking a clean break from Britain, even if it required violence ahead of politics. His victory marked a decisive breakthrough for the Sinn Féin party and the beginning of the eclipse of the constitutional nationalists of the Irish Parliamentary Party. 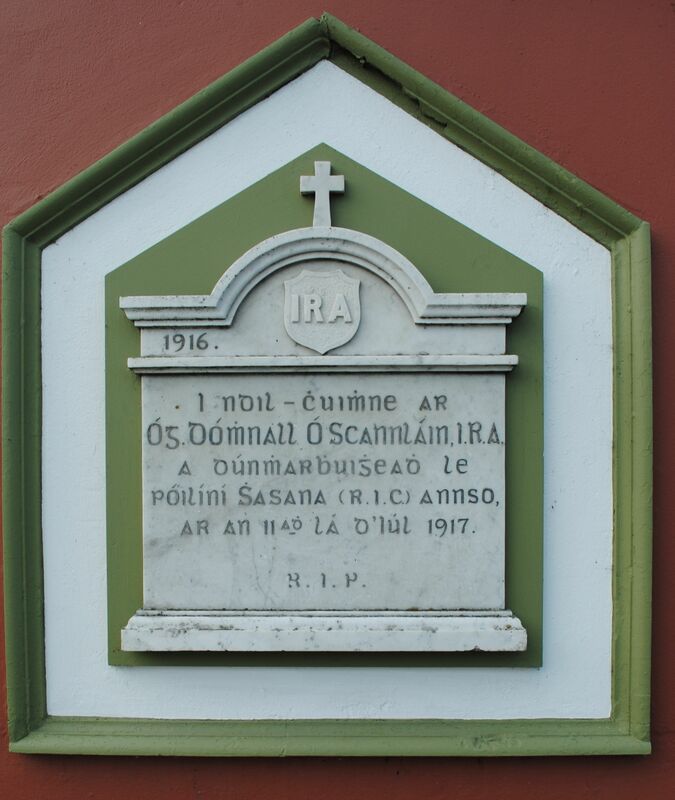 The following year, 1918, Sinn Féin, headed by de Valera, won a crushing victory in a general election and early the following year, declared independence, leading the Irish War of Independence. The post also features Dorney’s 35-minute podcast interview with Clare historian Pádraig Óg Ó Ruairc, who details the election and sets the context for this period between the Rising and the War. It’s a great listen. We hear a lot talk from politicians about how important this period of our history is commemorated … As far as I can see the 100th anniversary of this guy’s death was not commemorated. … This period of history is passing us by because the government’s official Decade of Centenaries [1912-1922] was disbanded after the last election a year ago, after the big 2016 centenaries. … It’s an indictment of the Decade of Centenaries that it was four years long; we went from 1912 to 1916 and then we stopped. I think what we are going to see for the rest of the Decade of Centenaries is that stuff that happened outside Dublin is not [considered] important. … It will be left to the people that always commemorate it, local historians, relatives, with not much state support behind it. In fairness, the official Decade of Centenaries website does note de Valera’s by-election win in its 1917 timeline. He is hardly forgotten in Ireland, given the large role he played as the 26 counties became the Irish Free State and eventually the Republic. By 1963, the elder statesman was still on the scene to welcome John F. Kennedy to Ireland. Scanlon, who was 24 in 1917, is easier lost in the Irish revolutionary period. The RIC officer charged with his death was soon acquitted. It also should be remembered that Scanlon’s death came 15 months after another Ballybunion native, Patrick Shortis, 26, was killed during the Rising in Dublin. Both of these rebel deaths catch my attention since my grandfather emigrated in 1913, at age 19, from the same village. He joined several cousins and other North Kerry immigrants in Pittsburgh, Pennsylvania. The city’s daily newspapers carried numerous stories about de Valera’s victory, but not a word of Scanlon’s death that I can locate. Both Shortis and Scanlon are remembered with small plaques on the sides of buildings in Ballybunion. A bronze statue of de Valera stands outside the courthouse in Ennis, Co. Clare, where his 71 percent to 29 percent ballot victory was tabulated a century ago. The level of attention generated by last year’s 1916 centenary events would be hard to sustain over a decade. Through the end of 2018, there will continue to be more focus on the events of World War I. But O Ruairc has a point about the general decline of interest in historical events from the period between the Rising the start of the War of Independence. The memorial to Daniel Scanlon in Ballybunion. This entry was posted in History, Irish America, Politics and tagged Ballybunion, Clare, Daniel Scanlon, Eamon De Valera, Ennis, kerry, Pádraig Óg Ó Ruairc, Patrick Shortis on July 21, 2017 by admin. 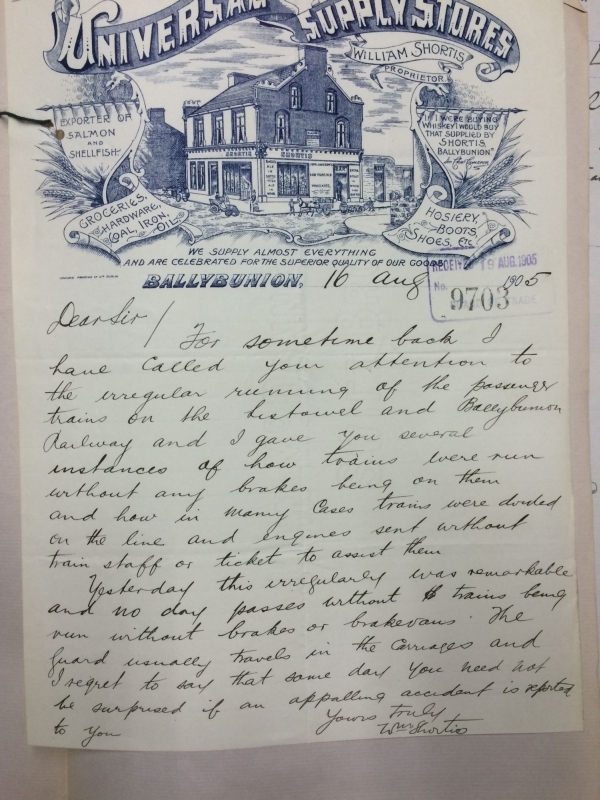 In August I wrote a post about how some old letters raised new questions about the Listowel & Ballybunion Railway, which operated between the two north Kerry towns from 1888 to 1924. In August 1905, two former L&BR employees wrote letters to Transport Ministry officials in London raising safety concerns about the line, affectionately known as the Lartigue, after its French inventor, Charles Lartigue. They made suggestions that an accident had happened, or would very soon. Transport Ministry officials brushed aside their complaint a few weeks later. My post noted that a derailment accident did occur on the Lartigue two years later, in October 1907. Now, in reading historic newspapers of the period via the Irish Newspaper Archive, I’ve found a link back to the 1905 episode. It occurs in a November 1907 legal proceeding in which the railway company was seeking compensation for the accident. According to Kerry Sentinel coverage of the 1907 proceeding, McCarthy replied: “…on the 15th of August 1905, four months after McAuliffe left their employment, the brake screws were stolen off the engine, and none but one of the employees could have done it.” A similar attempt was made at least one other time, he added. McCarthy would not be drawn on putting blame on McAuliffe, or anyone else, for the 1905 mischief or 1907 accident. Let me add here this news account is circumstantial and incomplete historical information. But, for me, it deepens the mystery. The other letter writer in August 1905 was Ballybunion merchant William Shortis, who had served as the town’s Lartigue station manager during the first decade of the line’s existence. He died in November 1905, a few months after his wife. News coverage of the day attests to the high esteem both of them were held. This entry was posted in History and tagged Ballybunion, Lartigue, William Shortis on October 19, 2015 by admin. 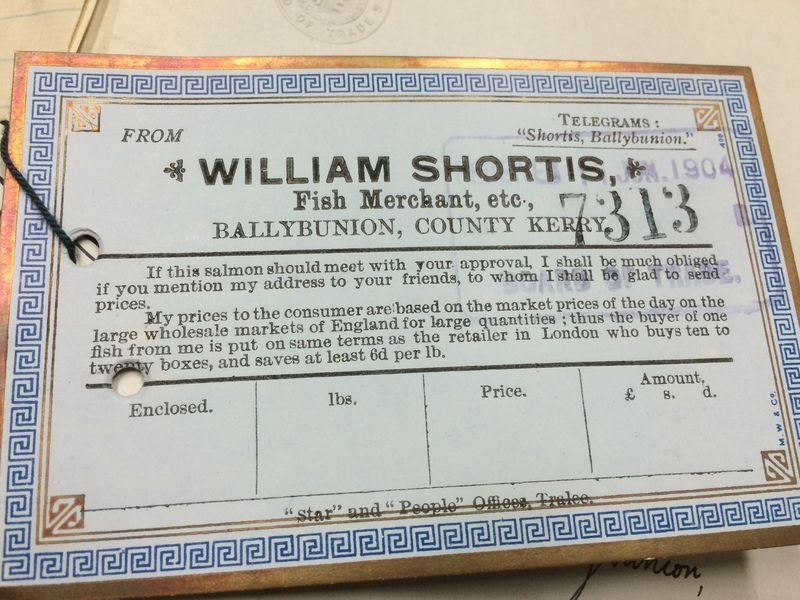 The 1905 letter quoted above and reproduced below was written by Ballybunion merchant William Shortis. The building he operated from in the late 19th and early 20th century, pictured on his letterhead, still stands in the northwest Kerry town, now run as a pub. 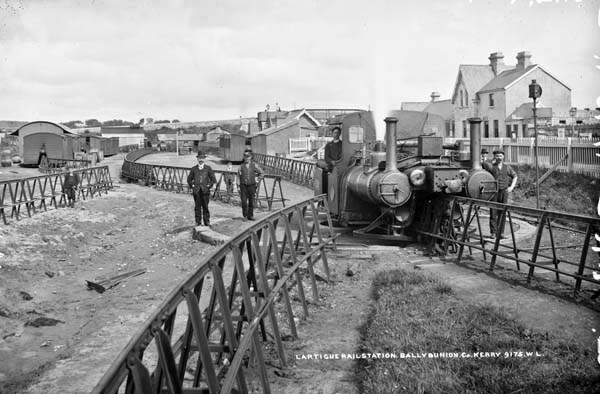 Shortis was writing to Transport Ministry officials in London about safety concerns for the Listowel & Ballybunion Railway (L&BR), a unique 9-mile monorail that operated between the two towns from 1888 to 1924. The line was affectionately known as the Lartigue, after its French inventor, Charles Lartigue. Most of the article, headlined “A Single-Line Railway,” detailed the Lartigue’s odd-looking rolling stock, which draped saddle-style over 3-meter-high, A-shaped trestles, and other aspects of the monorail’s operation. The train traveled about 10 to 15 mph, and Shortis wrote that each piece of rolling stock was fitted with Westinghouse air brakes. Which brings us back to his 1905 letter, which alleges “the trains were run without any brakes being on them.” Shortis was not the only one to make such a claim to the Transport Ministry. Jeremiah McAuliffe, a self-described former “general mechanic” of the L&BR for 18 years (approximately to the 1888 opening of the line) wrote to the ministry on 17 August 1905, the day after Shortis. “Thousands of lives on the mercy of the Lord traveling on a railway without a brake,” McAuliffe wrote. He said the train only had hand brakes, that the Westinghouse air brakes hadn’t worked “in years.” He also suggested the train had a recent accident. 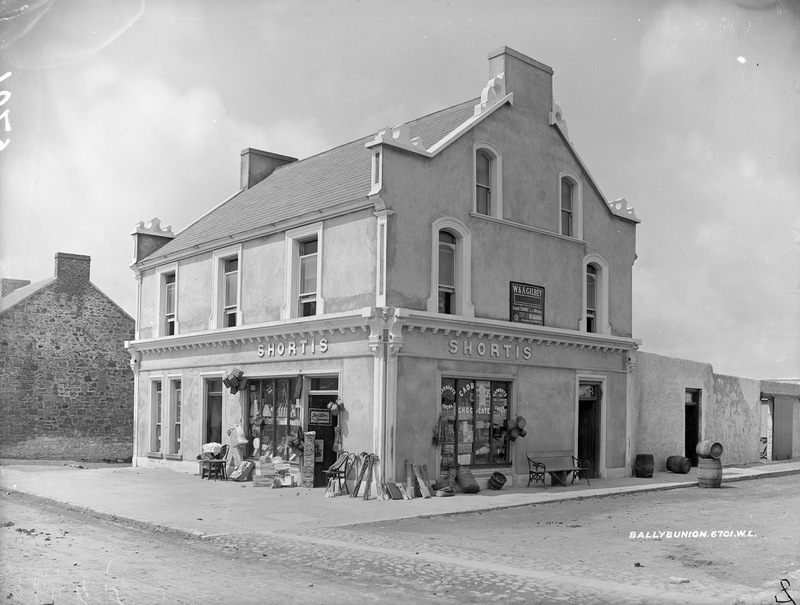 Shortis store in Ballybunion, circa 1901, is still there today. I viewed both these letters (and several earlier letters from Shortis making similar complaints) during my 24 July 2015 visit to the National Archives in Kew, outside London. The file, referenced here, contains material from 1887 to 1907, including the railway’s initial inspection report of 2 March 1888, and a follow up correspondence of 31 December 1888, which do raise minor concerns about the operation of the passenger carriage brakes. I did not review this material as closely as I would have liked due to the limited time of my visit. Based on 30 years of reviewing government papers as a journalist, I feel safe in saying the file is an incomplete record. It raises more questions than it answers. In researching and writing about Kerry’s unique monorail for several years now, I have come across a few references to accidents on the line. These appear to have been caused by vandalism, such as concealing branches or other debris within the A-shaped trestles, as reported with an October 1907 accident near Listowel, two years after the Shortis/McAulffe letters. The line had its share of mechanical breakdowns, to be sure, but appears to have operated in relative safety, no doubt helped by the plodding pace. I keep thinking about Shortis. The fact that he wrote all these letters on his own business stationary indicates to me that he no longer was associated with the Lartigue. He never mentions holding a position with the line. Or was he writing secretly, as a whistle blower? McAuliffe wrote that he quit the line in May 1905, three months earlier. When did Shortis leave, and why? Was he bitter about the circumstances? Shortis was 36 years old in 1905, based on the 1901 census record. (There are three men named Jeremiah McAuliffe from Kerry in the same census. Their occupations are given as farmer’s son, tailor and “no occupation.”) Shortis was a founding member of the nearby Ballybunion Golf Club in 1893, according to this centenary history. The grocery store proprietor and fish merchant was the father of five children. As a Roman Catholic, he likely contributed to construction of nearby St. John’s Church, which opened in 1897. William Shortis business card in the Lartigue file at the National Archives in Kew. But matters took a turn for the worse for Shortis in 1905. His wife, Annie, died on June 7, according to dates on the family gravestone at the Killahenny burial ground near the golf course. An online genealogy posting suggests that Annie died during childbirth. She was the same age as her husband. On the weekend before Shortis wrote his letter, Ballybunion would have held its annual Pattern Day celebration, a mix of secular activities blended with the Catholic feast of the Assumption of the Blessed Virgin Mary. (Though long celebrated on 15 August, the Assumption did not become official church dogma until 1950.) The Lartigue would have carried hundreds, perhaps thousands, of people to Ballybunion for the festivities. Shortis, a widower of just two months, must have dearly missed his wife at this holiday, which they surely had enjoyed together in earlier years. The Lartigue continued operating until 1924 without any significant accidents, at least that I’ve found in my research. The line, which never made much money, was repeatedly sabotaged during the Irish Civil War. It also was incompatible with the conventional railway system of the newly established Irish Free State. Automobiles were becoming a more common mode of travel across Ireland. Is William Shortis among these men standing next to Lartigue carriages at Ballybunion? Obviously, there is much more to this story than is presented here. There may be available details that I am unaware of, while other aspects of the story are lost to history and will remain unknowable to any of us. Perhaps some readers can help fill in a few of the blanks. I welcome additional information about William Shortis and the Lartigue. This entry was posted in History and tagged Ballybunion, Lartigue, William Shortis on August 15, 2015 by admin. More evidence the world is getting smaller. The FiveThirtyEight blog has an interesting post about Geograph, which has collected photographic images of nearly all the 244,034 one-kilometer squares of Great Britain and 41 percent of the 87,933 grid squares on the island of Ireland (Republic and Northern Ireland). “Geograph was started by geography enthusiasts, sponsored by the government, rescued from a chaotic collapse by its devoted contributors and populated with millions of photos from thousands of people around the island nations it covers,” Carl Bialik writes in the post. Naturally, I went to the site to look for familiar sights from my ancestral homeland of north Kerry. One in particular caught my eye. The 2010 image by Graham Horn (copyrighted but licensed for reuse) is taken from the Loop Head Peninsula of southwest County Clare. 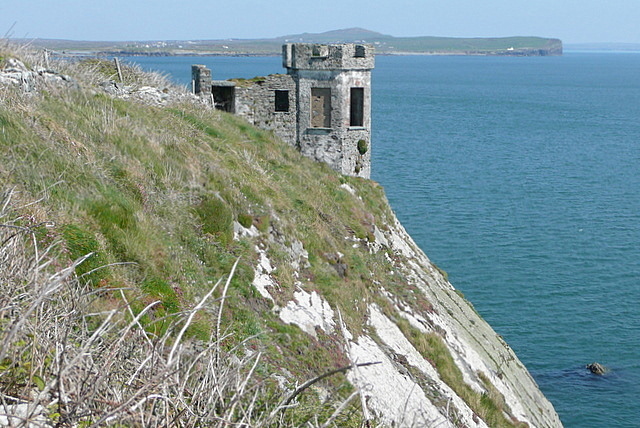 The view is looking east toward Kerry and Ballybunion on the far side of the Shannon estuary. The peak in the background over the top of the lookout tower is Knockanore Hill, where my grandfather was born. I’ve made numerous visits to the Ballybunion strand and the 880-foot top of Knockanore, where I’ve looked across the Shannon estuary at the distant shore of Loop Head. But I’ve never been to the Clare peninsula to look back at the north Kerry coast, as in this image. It remains a view I’d still like to see for myself someday. In his post, Bialik also discusses Google’s Street View and raises the question of whether Geograph could ever go global. Satellites and digital technology have made such near total photographic coverage of the earth possible. But it isn’t a new idea. Early in the 20th century French banker and philanthropist Albert Kahn dispatched teams of photographers with bulky Authochrome cameras. His project, called “Archives of the Plant,” featured images from more than 50 countries, including what are still believed to be the first color photos of Ireland in 1913. This entry was posted in Business & Environment and tagged Ballybunion, Clare, kerry on August 16, 2014 by admin. 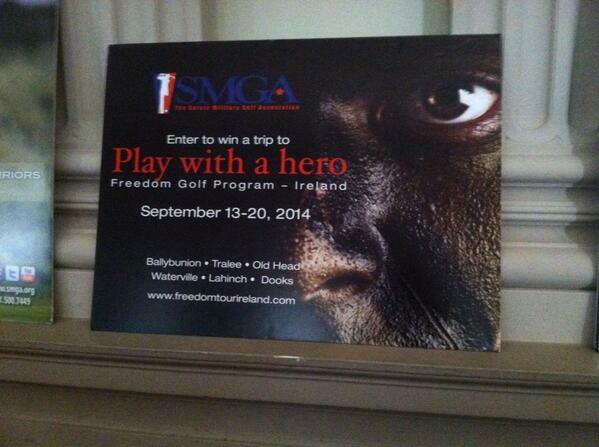 Twenty-five wounded U.S. soldiers will be treated to a 12-day golf trip to Ireland in September. I learned about the charitable event while covering a Capitol Hill press event about the economic impact of golf in America. The Ireland trip is sponsored by the Salute Military Golf Association, which seeks to “provide rehabilitative golf experiences and family-inclusive golf opportunities for post-9/11 wounded war veterans.” Eleven wounded veterans made the inaugural trip last year. This year’s tour, Sept. 13-20, includes Ballybunion Old Course, Tralee Golf Club and four other courses. For those looking for regular golf tours of Ireland, please consider contacting Niall Leogue, president of Caddie Tours in Vienna, Va, just outside Washington. Niall was one of the featured businesses at Irish Network DC’s recent Members’ Business Show (post below). Here’a link to the golf page on Niall’s website. This entry was posted in Irish America, Sport and tagged Ballybunion on May 22, 2014 by admin. I have written several posts this year about the terrible weather in Ireland. I am most saddened to hear about damage in my ancestral homeland of north Kerry, including Ballybunion. In our 10 February exchange on Twitter, Kay Caball of @MyKerryAncestor wrote: “Quite a bit of damage along the Atlantic Coasts – Clare & Kerry. Ballylongford & Ballybunion both badly damaged.” A more recent email from one of my relations in Navan detailed damage to the barn of another family member in Lahardane townland on the hillside overlooking Ballybunion and the sea. This entry was posted in Business & Environment and tagged Ballybunion, ballylongford, Clare, kerry on February 15, 2014 by admin. Islands off the Irish coast have been worst hit by the relentless pounding so far with a resident of Inishbofin of the Galway coast describing the weather as “the worst in living memory. … Thundery rain will lead to major flooding according to the national weather service, Met Eireann, which issued an orange storm warning. Towns and villages recovering from last week’s storms are now bracing themselves for another battering with high seas in excess of 40 feet expected on the south and west coasts. By coincidence, the storm comes at the 175th anniversary of the “The Night of the Big Wind,” as detailed in this fine piece by Turtle Bunbury at The Wild Geese. 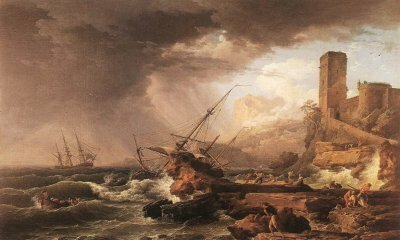 On 6th January 1839, the entire island of Ireland was subjected to a tempest of such ferocity that it became the date by which all other events were measured. The Night of the Big Wind – known as ‘Oiche na Gaoithe Moire’ – was the JFK assassination or the 9/11 of the 19th century. It was the most devastating storm ever recorded in Irish history and made more people homeless in a single night than all the sorry decades of eviction that followed it. Untitled image from The Wild Geese. In 1909 the British government, which was still ruling Ireland, instituted a system of old age pensions. When dealing with the rural population of Ireland, where the written records might be scanty, the ferocious storm that blew in from the north Atlantic 70 years earlier proved to be useful. One of the questions asked of elderly people was if they could remember the “Big Wind.” If they could, they qualified for a pension. 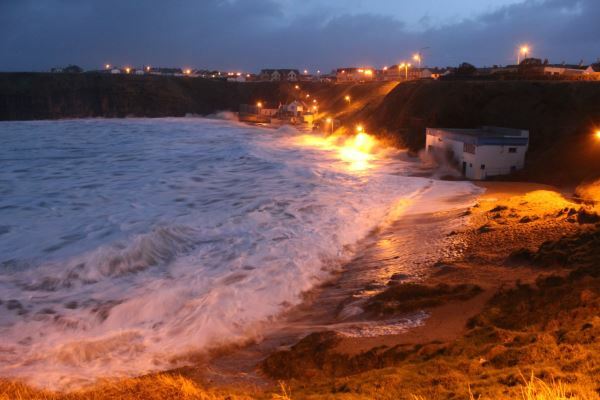 This entry was posted in Business & Environment, History and tagged Ballybunion, Night of the Big Wind on January 6, 2014 by admin. Two stories about 19th-century Irish railways have appeared in contemporary news headlines. In Kerry, descendants of Lartigue monorail workers met for a Gathering reunion at Listowel that also marked the 10th anniversary of the related museum and short demonstration line. 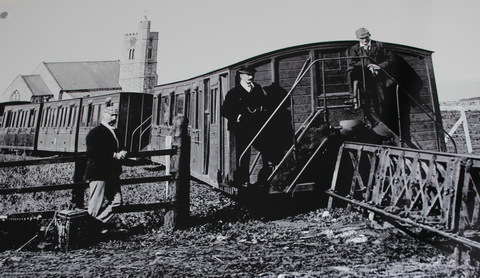 Lartigue monorail workers at the Ballybunion station. National Library of Ireland image. In Dublin, the 1877 railway tunnel underneath Phoenix Park has been drawing attention. The National Transport Authority proposed opening the line for passenger trains between Connolly and Heuston stations, but Irish Rail has balked at the plan. The Irish Times offers a video trip through the tunnel as part of its coverage. The tunnel opened five years before the Phoenix Park murders of Ireland’ land war period of the 1880s, which also was a time of great expansion for localized railways such as the Lartigue and the Tralee and Dingle Light Railway in south Kerry. This entry was posted in Business & Environment, History and tagged Ballybunion, County Kerry, Lartigue, Phoenix Park on August 22, 2013 by admin.